The Eee is laptop computer that weighs less than a bag of sugar. It has a 7-inch screen which is the size of a screen on a portable DVD player – much bigger than the mobile phone screens I’ve been browsing the web on of late. And the best bit… it cost only €300. I’ve been talking for some years about the ultimate device – the one that has everything you need in one place – phone, music player, Internet, email, camera. Well when I got a present of the Nokia N81 I thought I had arrived, only to be frustrated by the size of the screen – too small for any serious Internet work. 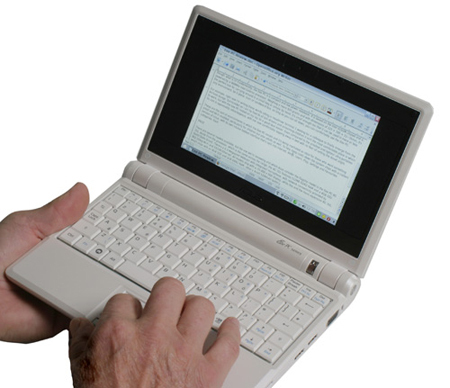 The lack of a qwerty keyboard (a regular computer keyboard rather than a mobile phone keypad) is a real problem. My appetite for now is satisfied however with this little purchase today; I’m happy for now with just two devices that between them give me everything I want. Someday someone clever will bring it all together at a price point that makes sense for everyone else aside from techno-junkies. I’ve bought the 4GB version which I thought would give me plenty of memory to keep me going for a while. However I’ve just spotted that there’s actually only about 1.3GB free – the operating system and applications take up about 65% of the space. I can stick on an external memory drive giving me 120GB for about €80. There’s an SD memory slot which gives me some other cheaper options. It comes wireless ready and I had it connected to my Eircom wireless broadband in a couple of minutes. It’s also network ready and if I had a home network set up I’m sure I could easily connect into it. At first I thought it had no applications on it and you would just use it to access the Internet and use online applications such as Google Docs. But to my delight it has a whole range of applications that you would expect to find on any new computer. The base operating system is Linux, and all the applications are thus open-source (free), and compatible with Miscrosoft. So I’ve got a version of Word, Exel, Powerpoint and Adobe PDF reader. The real beauty is that it has a whole host of Internet applications pre-installed. So with one click I can get into Skype, iGoogle, Messenger, and Internet Radio. It comes with a webcam, microphone and speakers pre-installed. The guy in the shop (Dixons) didn’t actually know this until I played around with the voice recorder application and played mine and his voice back. LOL – we’ve a friend staying at the moment and she’s amazed with this and can’t believe I bought it in Dixons which (her words) “isn’t even a computer shop”. Other things you’ll find (on your first day) include games, educational software (for the kids), and music, photo and video file managers. Well the memory might become an issue. I’ll let you know in time, but I guess I’ll just have to be ruthless about storing things online. Got my invite from Joe in PutPlace today, so that should help. The keyboard is taking a little getting used to – only really for caps though as the shift key is in the wrong place. I’m writing this though so it can’t be that bad. (Apostrophe key is in the wrong place too – that last “can’t” was a bit tricky.) Okay, and the screen is a little smaller than you might like on a laptop, but I’ve done F11 (full screen) in the browser and I get a good bit more space. The guy in the shop (I’ll leave him be now, as he actually was quite pleasant) told me that there was no anti-virus software installed but that I didn’t need any. The rationale being that all viruses are targeted at the Microsoft operating system and applications. Can this be true? Is the open-source world free from from the evil of worms, bots and viruses? Sounds too good to be true. Anyway I’m going to enjoy the new liter site of life for a while with my new white Eee. If you’re at the Darklight Web 3.0 gig on Friday (cheers Darragh) I’ll be the guy with the white Eee trying to look conspicuous. Pingback: Time-off(line) « Where have all the people gone?